Brighton & Hove Albion striker Tomer Hemed says he has joined Championship side Queens Park Rangers on a season-long loan to score goals. The 31-year-old forward has joined the west London club until the end of the season and could be set to make his debut against Wigan Athletic on Saturday. The R's sit bottom of the table having scored just twice in four straight defeats. Hemed, who has previously scored 30 goals in two seasons at Championship level, told www.qpr.co.uk: "I know the reason I am here. "I’ve good experience at this level. I scored goals in the Championship for Brighton, so I know how to do it. “I came here to score goals but also to create chances for others and be a big factor in the attacking side of the game. “I’ve done good things with Brighton and I can use my character to show that, even though it has been a bad period for QPR, we can do better every week. 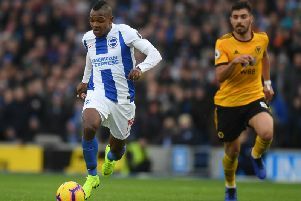 The Israeli international joined Albion from UD Almeria in July 2015 and scored 33 goals in 108 apperances in all competitions, but has found game limited since the Seagulls were promoted to the Premier League. Manager Chris Hughton said: “Tomer hasn’t been able to play the number of games he has done in recent seasons, and this move will give him a chance to play regularly. “It’s a highly-competitive Championship division, and a level Tomer knows well; we will keep a close eye on his progress throughout the season.